"Rumors say there's trouble brewing within the Tevinter Imperium"; "I've heard tell of increased patrols by their military"; "Well I heard there's whole tracks of land gone barren!" - if only they'd known then what we know now; that this was the beginning of the First Blight - April's Campaign of the Month! If you love Dragon Age as much as we do, then this is an adventure you don't want to miss! So join us as we interview jaythegreenling and find out more about this awesome campaign. 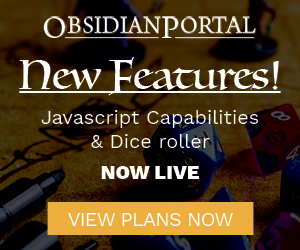 The official blog of the Obsidian Portal. There’s a bit of “follow up” in this post, but there’s also some new information, so take a read and see what’s going on. As the world of tabletop roleplaying games evolves into what feels like the future, I discern a desperate, mid-life-crisis-ish urge to stay abreast of the cool new tech that came out several years ago (I’m slow to adapt). 3D printing is one such cutting-edge contrivance… but I’m not willing to risk a large investment (read: I’m cheap) in a desktop 3D printer to make miniatures. Not yet, anyway. Instead, I bought a 3D Pen to see if I could wield divine power upon the (small-scale) realm of plastic! Low Level Loans: Begin by Borrowing? Can a player taking a loan at character creation be good for a game? Should the GM even entertain the idea? Yes! (But only with the right player, for the right character, and for the right kind of campaign and setting.) In truth, when carefully managed, a loan can pay out huge gameplay returns.